As a responsible healthcare institution, Euromed Clinic Center Dubai is well aware of its rights and obligations towards its patients. If a person does not understand both English and Arabic languages, we make arrangements to communicate all information in that person’s language. For us, the patient’s safety is the top concern because that is what were are here for. We never enforce people and make them take a treatment. The experts here explain each and everything about the treatment and let the person decide what he or she wants to do. Moreover, the Euromed Clinic also shares the cost structure and profile of the doctor. As a reputed clinic, we employ highly professional people who store and use the information of the patients for the benefits of patients. We have never and we have no intention to process the information of the patients in a wrong way. Actually, we have a sound internal system for quality assurance. Though it is not always possible to tell the patient exact cost without examining the patient thoroughly. It all starts with checking the patient thoroughly; then based on the medical history and current condition, our professionals prescribe the right cure. As a matter of fact, the cost of a treatment varies from person to person. The cost is different for different patients because every patient has a different way of life and health condition. When people visit us for an initial consultation, we inform them as best we can about the cost structure according to this initial assessment. We never hide any cost or expense before and during the treatment. The price for a procedure we share with our prospective patients represents all costs that that particular patient has to pay. In association with the local authorities such as Dubai Health Authority and Ministry of Health, we are working for the uplift of health standards in the city. We have done so much and have plans to do much more to raise the quality of life in the UAE. Due to our illustrious healthcare services, people trust us and visit us each time they come across a mental or physical problem. 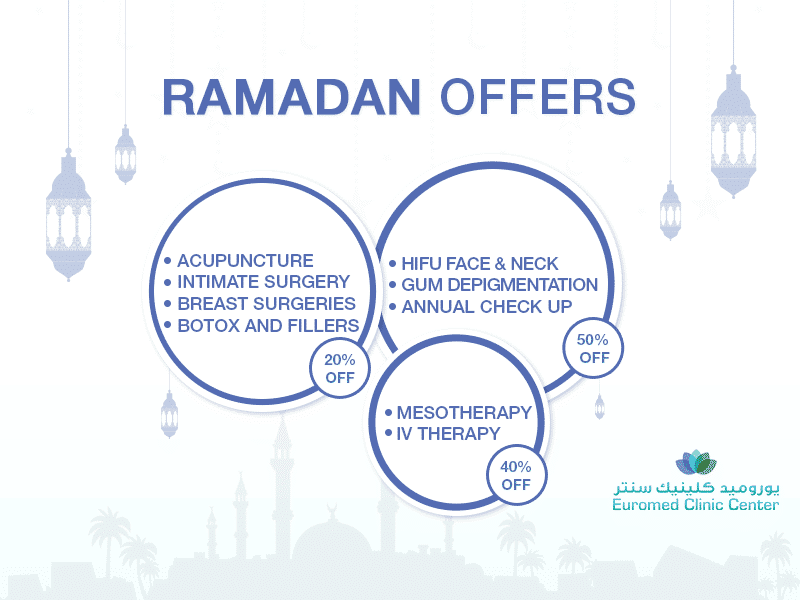 Euromed Clinic has always planned and executed what is best for its patients. In case of any complaint, we encourage people to contact us through our phone numbers or online forms. We have tried to post accurate information on this website to educate people. If any person finds any false information on this website should contact us. The privacy and confidentiality of the patient are one of our top concerns. Euromed Clinic Center Dubai is committed to safeguarding the information of all patients at all times. We collect the information of the patient through different channels because we maintain the record of patients for our internal use. We never share the proprietary or treatment information of the patient with anyone. Euromed Clinic Center Dubai employs responsible professionals who never share any patient information with anyone or any organization. All of our staff members have to sign a confidentiality agreement before they take charge of their role. Each and every person has a different way of life and health condition. Knowing more about the personal information and medical history of the person allows us to suggest the best possible cure for the illness. We store all information at a secure place and a patient can ask us for health records anytime. It is our policy to share the patient’s data with that patient only. A person can contact us during his or her lifetime to obtain the past data. If you need more information, please feel free to call us to speak to us or fill the short online form to write to us.